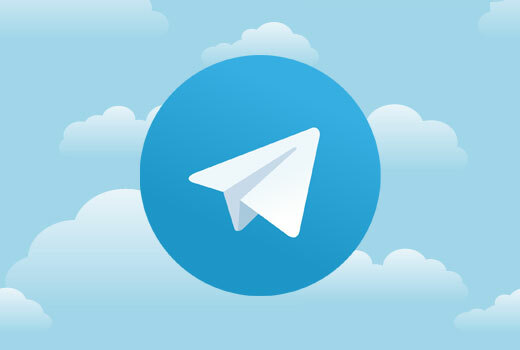 Telegram is one of the most steadily growing messenger app. It is incredibly fast, powerful, and can be totally private. It has an open API which allows anyone to hookup their own apps with Telegram. In this article, we will show you how to integrate your WordPress site with Telegram. Telegram is a cloud based messaging app. Think of it as WhatsApp, just more open, secure, safe, and private. Telegram allows you to communicate with your contacts. All messages sent by Telegram are encrypted can be easily deleted or self-destruct. You can send files as large as 1.5 GB each, all media can be stored on the cloud. Most importantly, it is free forever with no ads and no tracking. Telegram allows you to create and join groups, which are your own small communities. 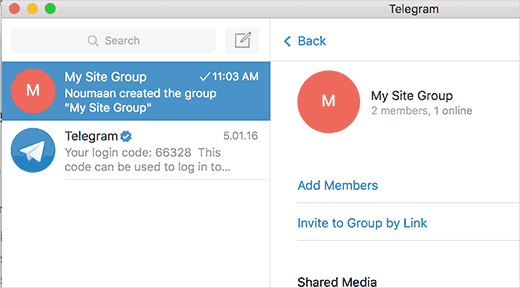 You can create open or private groups. Telegram also comes with features that are similar Slack, a popular collaboration platform for teams. You can create channels where you can broadcast messages to anyone who joins the channel. Again, channels can also be open or private, your choice. Just like Slack, Telegram also has bots. Anyone can create a bot and make them do things on Telegram. The most important feature of Telegram is their API which allows anyone to integrate their own apps with Telegram. There are already hundreds of integrations available for Telegram which you can use. The number of third party apps for Telegram is steadily growing. Why You Should Use Telegram with WordPress? Telegram is a communication app and it’s Slack-like features are making it quite popular among developers and remote teams that rely heavily on online communication tools. 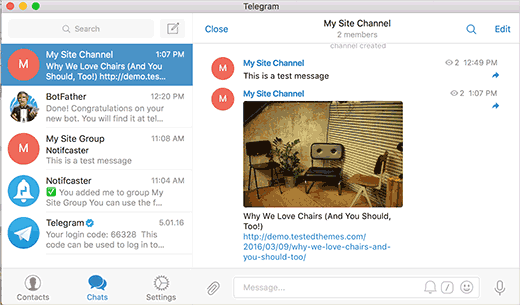 If you run or manage a small team working on your WordPress site, then Telegram is an ideal choice to be your communication platform. You can send notifications from your WordPress site to your Telegram group, channel, or profile. You can create private groups for your team for collaboration and communication. First thing you need to do is install and activate Telegram for WP plugin. For more details, see our step by step guide on how to install a WordPress plugin. Upon activation, the plugin will add a new menu item labeled ‘TWP Settings’ in your WordPress admin bar. Clicking on it will take you to plugin’s settings page. As you can see, it will need a few access tokens to connect with Telegram API. Depending on where you want to send the notification in Telegram, there are different ways to generate API tokens for individual chats, groups, and channels. Start by downloading and install Telegram app on your device. It is available for Android, iOS, Mac OS X, Windows, and Linux. If you haven’t already installed it, then simply go to Telegram apps page to download and install the app for your platform. With Telegram for WP plugin, you can receive your WordPress notification emails directly in your Telegram App. Here is how you would set this up. 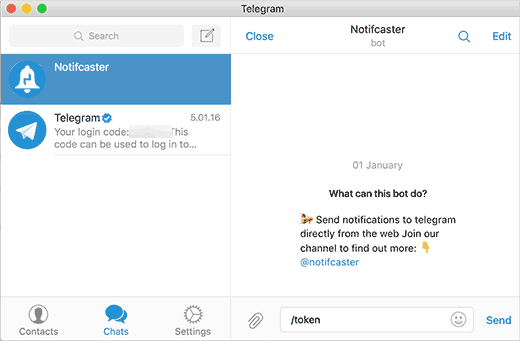 First you need to start a new chat with notifcaster_bot in Telegram. Simply click on the search box in the app, and then type notifcaster_bot. Telegram will show you the bot profile, clicking on it will open a chat window. In the chat window, you need to type /token to generate an API key. The notifcaster bot will generate one for you, and it will display the token in the chat window. You need to copy the API token and paste it in the API token field in plugin settings. After that you can send a test message by clicking on the send now button. You will now receive a test message from notificaster bot in Telegram. If everything worked fine, then you can now click on the save changes button at the bottom of the page to store your settings. You will now receive notifications from WordPress directly in Telegram. This is particularly helpful if you are having trouble receiving emails from WordPress. If you want, then you can also send WordPress notifications to a group of users using Telegram. First you will need to create a new group in Telegram and invite the users you want to be included in the group. Add at least one other member than yourself to the group. Once you have created the group, it is time to invite notifcaster_bot to your group. Click on your Group name at the top. This will bring you to Group settings. You need to click on the add members and then add notifcaster_bot to your group. The notifcaster_bot will now generate a new API key in its own chat window. This API key will start with g: prefix. Simply copy and paste this api key in plugin settings and save your settings. 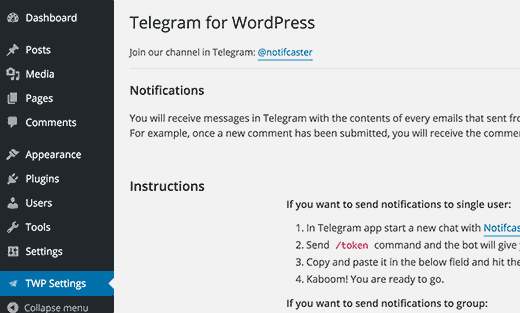 You will now receive WordPress notifications in the Telegram group. If you are sending the notifications to a group, then you will not receive notifications in the secret chat window with the notifcaster bot. Make sure that you only add users with admin access to your site in this group. Because, these users will be seeing all notifications that site administrator receive in WordPress. Telegram channels are chatrooms that can be private or public. 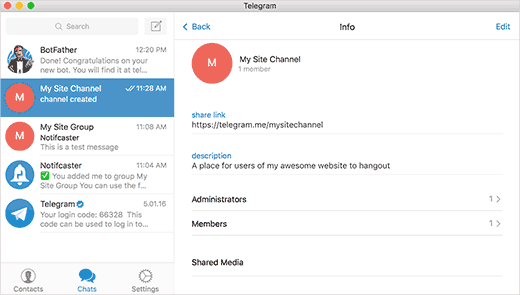 As a site owner, you can use a Telegram channel for your site’s visitors where they can hangout with other users. 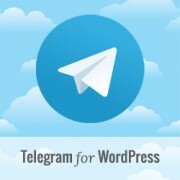 Let’s see how to create a Telegram channel, and how to send WordPress posts to your Telegram channel. First, you need to create your channel. Simply click on the add new icon and select new channel. You will be asked to provide a name and description for your channel. You will also get a chance to choose a short URL. You and your users can use this URL to invite other users to the channel. After creating your channel, you will also need to create a Telegram bot. Don’t worry, you don’t need to write any code in order to create a bot in Telegram. Open a new secret chat with the botfather. In the chat window, type /newbot and botfather will create a new bot for you. It will ask you to choose a name and username for your bot, and then it will show you an API key. Switch to your Telegram channel, and click on channel name at the top to access channel settings. On the settings screen, you need to click on Administrators. This will show you the list of administrators on your channel. You need to click on add administrator and then type the username of the bot you created earlier. Now you will be able to add the bot as an administrator to your channel. Switch back to botfather chat window and copy the API access token it gave for your bot. Paste this access key in plugin settings next to bot token option. Add your channel username with the @ sign. Your channel user name is the same name you used in the channel short URL. Click on Send Now button and the plugin will send a test message to your channel. Don’t forget to click on the save changes button to store your settings. 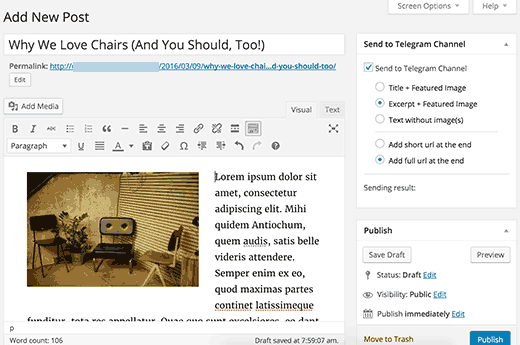 That’s all, now you can send posts directly from your WordPress site to your Telegram channel. On the post editor screen, you will find the options to choose how you want to send the post to your Telegram channel. When you publish or update a post, the plugin will send a message to your Telegram channel using these settings. We hope this article helped you learn how to integrate your WordPress site with Telegram. You may also want to see our guide on adding a points system in WordPress to ignite user engagement. Hi. Could I send notification to telegram when someone fill in the form in my wordpress website? how ican send from telegram to my blog in wordpress? i use zapier to send my posts to telegram,i want to know can i use a code at the end of my post that show “inline buttons”? or is there any plugin for showing this buttons? How do to send messages from telegram to wordpress with zapier ? we have recently formed a non-profit Association in favor of parents of autistic children. We have built a web page using a WordPress theme. We want to have a discussion Forum within our web page using Telegram which must me syncronized with our mobile phone, Ipads, etc, etc to make it more user-friendly since we have several subgroups within that discussion Forum (so that we can upload info at all times, etc). We don’t want just notifications, we don’t want a chat… We want to replicate within our web page what we have on our mobile phones. In other words, I would like to synchronize my Telegram Desktop app with that in my Iphone (which works wonders) but now in our WP Site. I’ve looking for ways to embed a Telegram channel on a wordpress static page. Do you know if this is possible? there is a way, but it will send too all of your users. Nice, someone did similar thing with whatsapp for my blog, about sending post to telegram can it be down automatically? Will for example sites forms gets sent to my Telegram now? Yes, it would send form emails to Telegram as well. For privacy you may want to keep those notifications limited to a individual user or a private group.